DITKOMANIA #91 is now out, the latest issue of the long-running fanzine from publisher-editor Rob Imes. This is the first issue from the modern Imes-era to have full colour covers, both front and back. 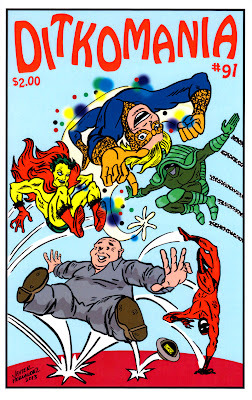 The focus of this issue is Ditko's bouncing heroes, as seen on the Javier Hernandez cover, with a lot of attention to 1980s creation Speedball, with a lot more Speedball fan-art than you'd expect existed. This issue also has an extended letter-column with a lot of reactions to Ron Frantz's article from the previous issue and Frantz's replies. Ordering and subscription information over here. Other recent possible Ditko, Archie has a recent NEW CRUSADERS: LEGACY book, which apparently includes some 1980s Ditko. The revived Valiant had a recent VALIANT MASTERS: SHADOWMAN reprint which should include Ditko's SHADOWMAN #6 . And Marvel has a recent reprint of some of Ditko's Captain Universe stories from 1980-1981 and 1989-1990. Feel free to comment if you have any of these and have specific details about the contents.